We are leading manufacturer & supplier of the Precision Components, which is appreciated by all our customers for its great quality. We offer Brass Battery Terminal to our valuable customers. These are widely used in the construction industry for effectively sticking doors and windows to the walls. These have a lustrous finish that does not wear off for a very long time. These are durable and highly resistant to corrosion and abrasion. These have been manufactured using premium quality brass procured from reputed vendors. These are made available at market leading prices. 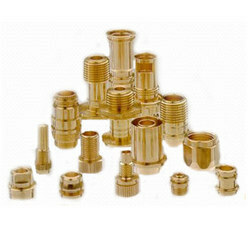 We are engaged in the manufacture and supply of Brass Precision Components that can be applied in variegated manufacturing units. The product range is applied to enhance the performance of machines and equipments. These components have wear resistance and endurance to high temperatures as its characteristics. Use of supreme quality raw materials is ensured while manufacturing.